Can A Tooth Be Replaced? You can diligently floss and brush your teeth and still lose a tooth, to gum disease or accident. If this happens, the tooth should be replaced in order to restore your smile, regain your chewing and prevent other teeth from shifting. There are three main types of artificial teeth and each one is designed for a particular situation. They are dental implants, removable dentures and fixed bridges. A DENTAL IMPLANT is made by surgically placing one or more small metal posts beneath the gum into the jawbone. In a few months, when they are attached to the surrounding bone, they are exposed and have the artificial tooth or teeth attached to them. A REMOVABLE DENTURE replaces all of the lost teeth in the arch with one appliance. The denture is held in place by clasping some of the remaining teeth or by suction where none of the natural teeth are left. 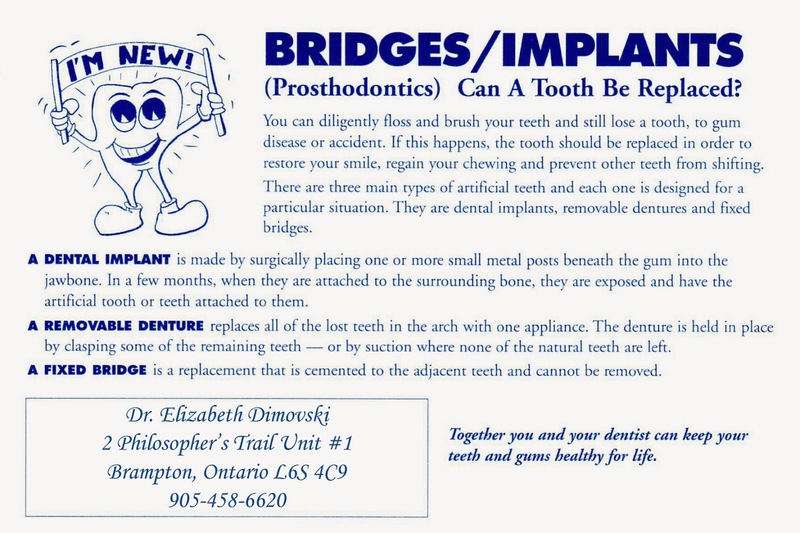 A FIXED BRIDGE is a replacement that is cemented to the adjacent teeth and cannot be removed. For more information on these or other topics be sure to contact one of our dental professionals. This entry was posted in Tooth Replacement and tagged Brampton, Dental bridge, Dental Crown, Dentist, Dentures, Denturist Brampton, Periodontist, Tooth Replacement by Lifeology 101. Bookmark the permalink.